Both the PC and Mac version now have a launcher so that the game client will be kept up to date automatically! Having problems with the installer? You can try the standalone executables for Mac and PC. The iOS version is available for free on the App Store. 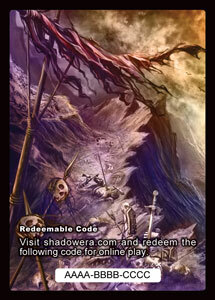 Shadow Era is now available on the Android Market. Find players in your area by contacting our Champions. Look for upcoming events in the Event Calendar. Buy cards in the Online Store. Stores interested in carrying the game can contact our distributor, Alliance Game Distributors in the USA, or contact us directly at kyle@wulven.com to set up a wholesale discount.